Aidan O'Brien's unbeaten Camelot picked up another Classic as he added the Dubai Duty Free Irish Derby at the Curragh to his impressive haul. O'Brien had expressed concerns about the heavy ground, but the red-hot favourite was travelling sweetly as he moved up to pass Akeed Mofeed and Light Heavy entering the closing stages of the contest after early leader Astrology had faded away. It wasn't over, however, as Camelot needed to knuckle down to ensure he held off Born To Sea, who was last for most of the way but put in a spirited challenge. The winner hung left in the closing stages but did enough to score by two lengths. With victories in the 2000 Guineas at Newmarket and the Derby at Epsom already in the bag, Camelot still has the option of tackling the St Leger at Doncaster in September and trying to become the first winner of the Triple Crown since Nijinsky in 1970. O'Brien was winning the Irish Classic for the seventh successive year and Camelot is his 10th winner of the race overall. He said: "We really felt it wasn't the right thing (to run on this ground), but he's a great horse. He's a real fast ground horse. We appreciate all the hard work everyone's put in, the sponsors, the Curragh - I can't say how thrilled we are to be part of it. It doesn't get any better than this. These are days you can't dream of. "He's by far the best we've had - we've never had anything like this. He had the speed to win the Guineas, the class to win the Derby and then he had to have class, courage and stamina to win today. The lads will speak about the Triple Crown now, wouldn't it be something to dream about?" 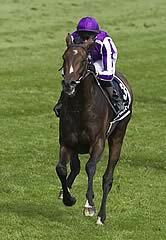 O'Brien jnr added: "He wasn't handling the ground at all. He has a big heart and tries very hard. He's got himself out of a hole because he hated that ground. I travelled very well, nice and relaxed, I never had a worry throughout the race, only he was hating the ground! "I knew underneath me that he wasn't liking it and it's testament to the horse he is that he's won today. I think he's a very, very good horse. He showed today how big a heart he has, that he can pull himself through that ground and still win big races quite easy." Co-owner John Magnier said: "He hated the ground - we were lucky to get away with it. We'll have to talk to Michael (Tabor) and Derrick (Smith) about the Triple Crown, but they're older than me so they'll want to go there!" Born To Sea is a candidate for the Irish Champion Stakes following his second-placed finish in the Irish Derby. The improving John Oxx-trained colt gave Camelot a mini-fright at the Curragh on Saturday when he got to within two lengths of Ballydoyle's Triple Crown aspirant. Born To Sea, a half-brother to Sea The Stars, is now in the frame to contest the Irish Champion at Leopardstown on September 8. Oxx said: "Every time he runs, he runs better than the previous time. "I thought he had him (Camelot) for a while, but the last 50-100 yards the ground sorted him out. "He just flagged a bit at the end, but he's beginning to make his own mark. "He's tough and genuine and takes his races very well. 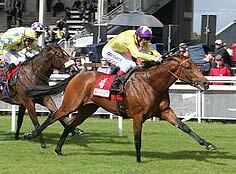 "We may aim Born To Sea for the Irish Champion Stakes. "Whether or not he'd have a run beforehand I don't know."